Welcome back to our Ask the Home Flooring Pros feature where we answer your most frequently asked questions. This week we look at how to apply polyurethane and specifically the best way to apply it to a wood floor, rather than any other kind of woodworking project. We show you all the tools you need and how much they cost, then we take you through the steps of applying water-based and oil-based polyurethane to your hardwood floor, both how to cut into the edges of your flooring and cover the larger central areas efficiently. Before you embark on applying polyurethane yourself it’s worth asking yourself how much you are saving doing the work yourself vs the time saved hiring a professional. If in doubt take a minute to get advice and free estimates from local contractors. Step 1: Sweep the floor and then damp-mop it with water and white vinegar (10:1 ration) or go over it with a tack cloth. Step 2: Use the 5″ to 3″ brush to apply polyurethane to wood flooring edges, and use the roller or pad to apply it to the center of the floor. How Many Coats of Polyurethane for Hardwood Floors? The best practice is to apply three coats of polyurethane, allowing the floor to dry, and lightly sanding it between coats. Some finishers offer lower estimates for two coats, but your floor won’t have the same level of protection, and scratches will go through to the wood more easily. In short, you will save yourself a bit of work or a little money by opting to apply two coats. However, you will sooner be faced with the expensive task or refinishing your hardwood flooring. 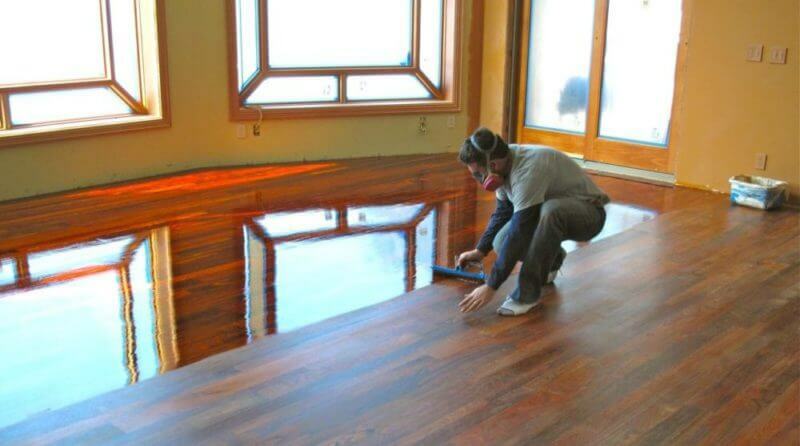 Pete’s Hardwood Floors – Pete explains why you might not want to stain your own floor. www.minwax.com – Great products and great resources. You can also read our guide on how to refinish hardwood flooring. Thank for sharing. How long did it take you to finish your job? I’m planing to renew my hardwood floor. Your article is useful for me. Thanks a lot. How long does it usually take to dry completely after you’re finished applying? It depends on how many coats you apply. Once you apply one coat, it is ideal to wait at least 4-6 hours before sanding. However, if the coat is still tacky, wait for it to completely dry. It’s best advised to wait at least 7 days before applying carpet and furniture to the room. Is there a protective coating to apply to hardwood floors after polyurethaning them..chair marks are occuring. Felt pads help minimize scratches from furniture that slides around. do you recommend a fresh roller/pad for each coat or do you reuse?